Sintim was recently selected for the Award of Excellence by The Graduate & Professional Student Association (GPSA) for his accomplishments and contributions as a Research Assistant during the 2016-2017 academic year. Nominated for the award by faculty Markus Flury, Sintim has a lot to be proud of. 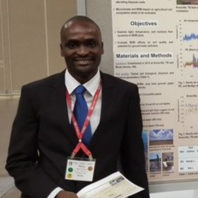 On top of a normal PhD workload, Sintim also writes his own proposals, is active on the graduate student committees of the Crop and Soil Science Societies of America (currently serving as a Member of the Board of Directors), and has impressively and independently maneuvered his portion of his research project with over 30 scientists involved.